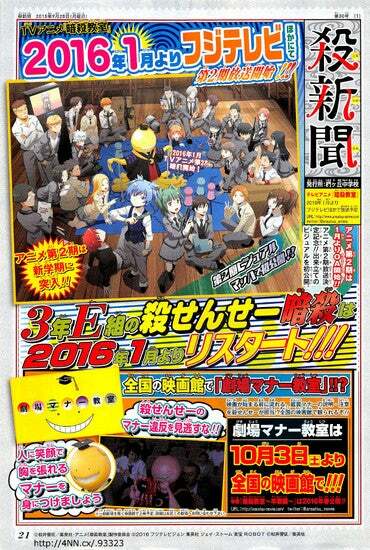 On the pages of the new edition of Shueisha´s Weekly Shonen Jump it has been revealed that the second season of Assassination Classroom will come in January. The Characters will appear on a new semester that it is begining. It also announced that Kuro-Sensei (That Yellow octo-thing) will make a video about how to behave properly on a Movie theater, and said video will be shown on movie theaters on October 3.